I’ve been excited to try the Salomon S-Lab X Alp Carbon GTX boot ever since I first heard about their development in 2014. The Salomon X Alp Carbon is a crampon compatible GTX hiking/backpacking shoe that is lightweight, yet fully rigid. I wore the La Sportiva Crossover 2.0 GTX for all of my winter hiking last year, and although I really loved that shoe, it left me wanting something a little more rugged and substantial when the going got tough. My winter boot choice is always a bit limited, as I try to avoid constricting hightops and unnecessarily heavy boots. Living in Southern California, our winter conditions just don’t call for that kind of protection. I live in trail runners for the rest of the year, so I’ve never been able to fully transition into a full on hiking boot. The Salomon X Alp Carbon is the perfect middle ground, as it provides the outsole and midsole of a mountain boot, with the upper of a trail runner. I’ve been able to give the X Alp Carbon a nice bit of testing this winter and am excited to share my review. 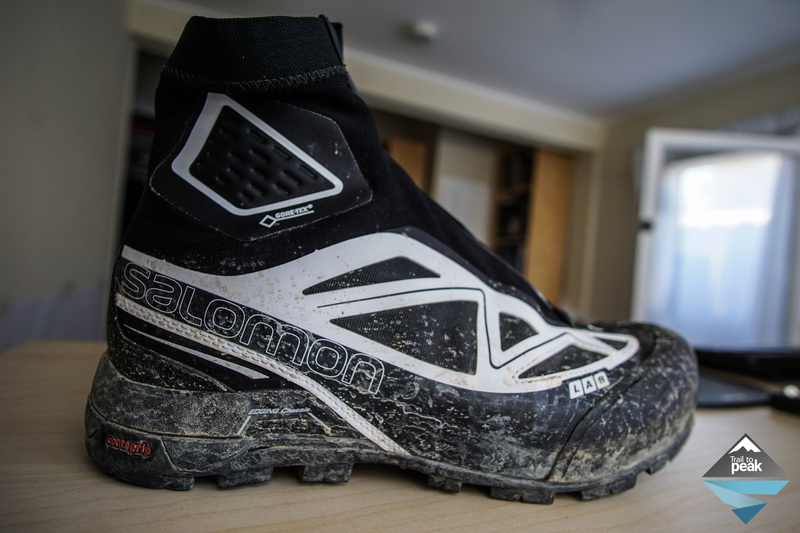 I usually wear a size 12.5 in Salomon trail runners, but a size 12 in the Salomon X Alp Carbon fit me perfectly. With a thick wool sock, I still had plenty of room in the toe box to prevent my foot from hitting the front of the shoe. The fit of the X Alp Carbon is on a mountaineering last, and much wider than Salomon Trail runners. The only Salomon shoe I’ve tried that comes close is the X Ultra hiking shoe. The heel on the X Alp Carbon is a little wide for my taste. I have a narrow heel though, and prefer the precise fit in of the La Sportiva Crossover 2.0 a little more. The inside of the X Alp Carbon shoe feels great and didn’t cause any discomfort or hot spots. I can’t say the same about the bootie though. The stitching on the internal liner is a bit crude and leaves a thick seam of fabric right along the heel and achilles. This broke in after a while, but caused me some serious hotspots on my first few hikes. The X Alp Carbon is rated at 20 F, which I found to be pretty accurate. Like most boots, you can hike in lower temperatures without much issue as long as you keep moving. When temps were right around freezing, these shoes handle the cold with no problem. My size 12 comes in under 20oz per shoe. Not bad when you consider the competition. The upper starts with an outer bootie that protects from debris and snow. The bootie has a seam sealed zipper that has done a great job at keeping moisture out. The bootie has padding on the ankles to keep any knocks or heel clips from doing damage. This is a nice addition, as it provides some of the protection found in high top boots without the diminished ankle articulation. The rest of the bootie has an ankle height TPU rand to keep the mud and slush away when plunging my feet into softer trails. The toecap is ridgid and strong, providing the perfect platform for kick steps. The bootie uses a full GTX lining for waterproofing. Under the bootie is the actual shoe, which has a long tongue that runs up to the top of the bootie. Salomon uses it’s tried and true quick-lace system to keep the shoes snug. The midsole of the X Alp Carbon uses Salomon carbon edging chassis, which offers great lateral stability while providing heel to toe flexibility. This is one of the things I love most about this shoe. Even though it’s rigid and offers protection, it’s still very walkable. A dense compressed EVA is used for the rest of the midsole, and is highly responsive. This is the biggest change from me coming from the La Sportiva Crossover 2.0. That shoe was plush like a trail runner. The X Alp Carbon is much more firm. I think I’d prefer something in the middle, but do like the X Alp Carbon a bit more. The X Alp Carbon uses a full coverage Contragrip outsole with a climbing zone on the toe. Salomon describes these shoes as best being used “For speed oriented, professional mountaineers during ridge ascents, easy climbing sections, and glacier crossings.”. I haven’t been able to use them om glaciers, and I’m not a professional, but they have been great for ridge ascents, winter hikes, and easy climbs. The outsole has proven to be very grippy and stable on a wide variety of surfaces. So far, the durability has been superb, with my pair of X Alp Carbons showing virtually now sign of wear. If you’re looking for a lightweight, low-cut option for fast days in the mountains, the Salmon X Alp Carbon might be the perfect shoe for you. They’re a little pricey, coming in just shy of $300, but you get a lot of great performance features for that premium price tag. I’ve used these for an entire season now, and they have a good two or three seasons of heavy use left in them. How did these handle below the rated 20 degrees? I’ll be looking for some winter boots in the Fall and these look nice. I’ll be using them to climb the Presidential Range and other high peaks in New Hampshire where it is common for it to be 0 or lower and a windchill of -20 and lower. I probably won’t be hitting the trail in conditions below 0, but I’m curious what your thoughts are. This season I used my old Timberland Thorton Mids, so I’m accustomed to keeping moving in order to keep warm. It’s hard to say, as we don’t really get temperatures like that here 🙂 In the teens, they felt pretty good. Not a lot of insulation, so probably not great. If you’re moving fast and it’s not too cold, they should do alright. If it’s 0 to -20, you might want to opt for something a bit warmer. Very interesting review (also one of the few on these promising looking hybrids). Would the Ultra X’s qualify in that sense? I’m looking for something bit stiffer than the Crossovers, but more smooth than winter boots. I like the X Ultra but am in between sizes as Salomon doesn’t offer a 12.5. 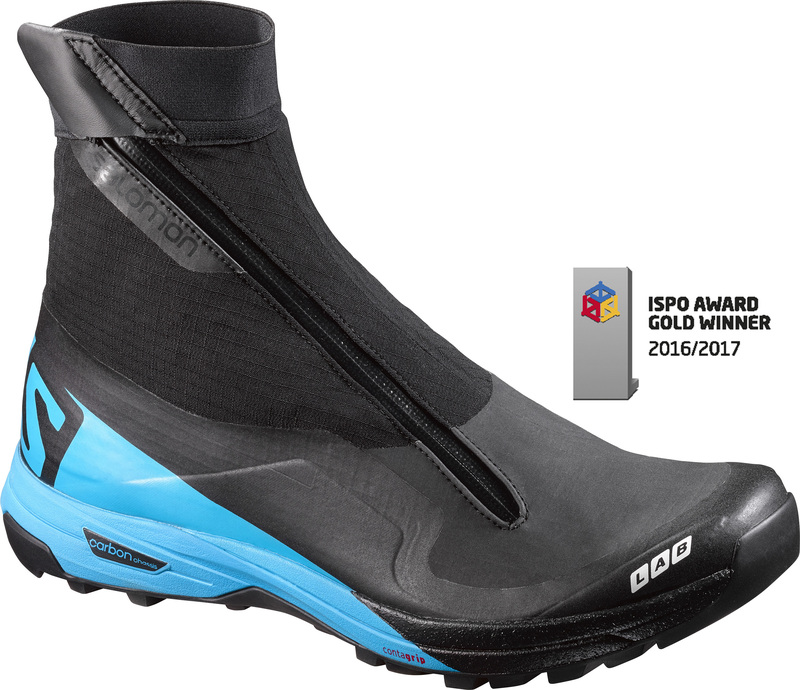 I’m most excited about the SLAB XA Alpine coming out this fall (https://trailtopeak.files.wordpress.com/2016/07/salomon_s-labxaalpine_ispogold.jpg). They look to be the perfect hybrid shoe. The X Alp Carbons are great though if you’re looking for something stiffer than the Crossovers, but more nimble and smooth than winter boots.